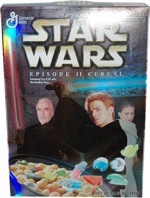 This limited edition cereal was a tie-in with the 2002 film Star Wars Episode II: Attack Of The Clones. The cereal consisted of sweetened corn puffs and marshmallows in the shapes of a clone troopers, lightsabers, Yoda, R2-D2 and space ships. Two collectors edition boxes were created for the cereal, one featuring Ewan McGregor as Obi-Wan Kenobi and the other with Hayden Christensen as Anakin Skywalker. 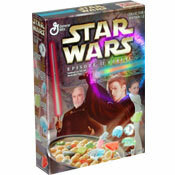 In 2005, Kellogg's produced the cereal for the next film in the Star Wars series, Star Wars Episode III Cereal. Kellogg's was also responsible for the first Star Wars cereal, C-3PO's, in 1984. What do you think of Star Wars Episode II? Still have a couple of boxes (long since empty) sitting on my Star Wars display shelves next to a couple of Star Wars Happy Meal toys and Pizza Hut Episode I collector cups. The cereal was great. While it wasn't exactly a unique taste, it also wasn't quite like any single cereal that I can recall having. I was sad when the line ended and wasn't either repackaged as a general Star Wars themed cereal or as just the same cereal under a non-franchised name. Haven't really found anything else quite like it since. 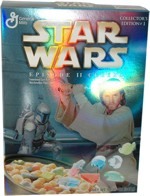 This Star Wars cereal looks SO awesome! I never had it, but I want it.... Anikan is my role model! But, I will never turn to the dark-side like him... MAY THE FORCE BE WITH ALL US STAR WARS NERDS! I love Star Wars! 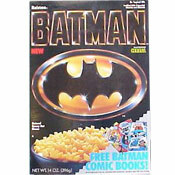 I never got to try this cereal, but if it came out again, I'd buy it. I am a Star Wars Nerd! It rocks! This was definitely one of my favorite childhood cereals. Even though the box didn't say it was peanut butter flavored, it tasted a lot like a cross between Reese's Puffs and Lucky Charms. This stuff was the best!